This experience will leave a life long impression upon me. The vastness and enormity of the ocean’s life hit home for me. We did 7-10 minute trawls with a trawl net that had a square opening of 3 meters. The variety of organisms that we pulled up was huge. You can see a picture of it in a previous blog and the picture does not do it justice. When one considers the path we fished compared to the size of the Bering Sea and then the size of other oceans it becomes quite overwhelming. This does not mean that the human can do whatever it wants to it though because of this vastness. I believe we are the stewards, protectors of this planet and after this trip even more so. It is nice to know that we have a government agency (NOAA of course) and groups of scientists that have a sense of stewardship towards the planet and all biotic and abiotic factors here on our blue marble. Another aspect that made an impression on me is how the members on board had a genuine curiosity of what we were pulling out of the ocean. 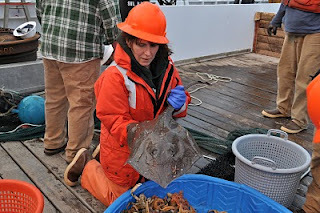 It was not unusual to have someone looking over our shoulders to see what we brought up in the trawl. Questions were often asked, and as stated earlier, happily answered by the scientists. Everyone seems to have a care for life and the creatures that come from the ocean. I think I have an understanding of the fondness that someone may have for a ship. I truly understand why they have names too. This may sound corny but the ship almost becomes an organic entity. I do not know if it is because we are land dwelling creatures and the ship gives us a comfort and feeling of security or what. I know the ship is only a piece of equipment and it is truly the crew who keeps it alive and able to protect the people on board. Ha, the food. I would be remiss if I did not mention the food (again). From the fresh made donuts, to the great selection of meals, I will miss the galley. There is every opportunity on board the Miller Freeman to eat healthy and well. 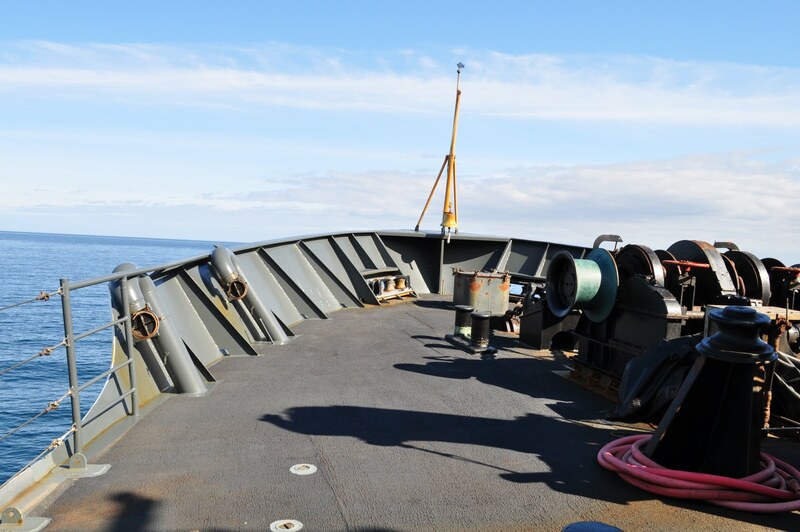 Seeing that we are coming to a close I would like to give you my email address because I may not always check the comments on this blog and would like to answer any questions you might have regarding my experience in the Eastern Bering Sea aboard The Miller Freeman. What an adventure, go NOAA. In this blog I will make an attempt to answer more of the questions I have been receiving. 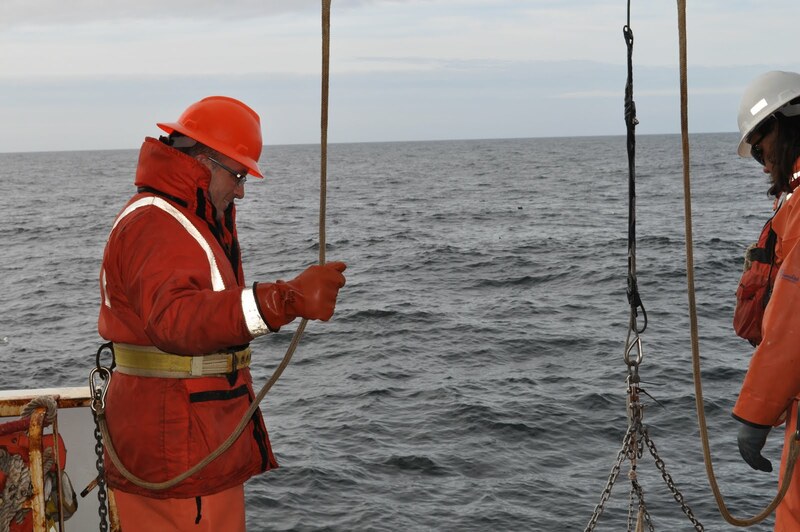 Once we catch the fish, which is only done using the beam trawl, the winch pulls them on board. Because of the size of the net and the limited time that we are pulling it, the catch is not too large. The catch can then be lifted by hand into the kiddie pool and sorted. If the catch happens to be a little heavy, one of the cranes picks it up and dumps it onto the sorting table for all of us to gather around and do our thing. The juveniles that are of importance to this study are bagged and labeled, then frozen. 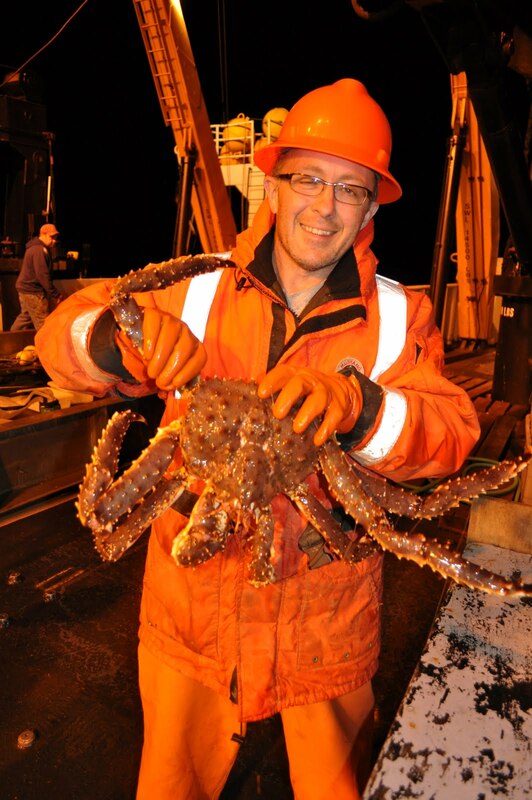 They will be studied back at the lab in Seattle, at the Alaska Fisheries Science Center, AFSC. Each of the three methods used have a different purpose and the only method that actually catches fish is the beam trawl. The different species are sorted, measured and weighed. The juveniles are kept and the larger ones are weighed, counted, and returned to the sea. Last night we caught over 100 yellowfin sole in one haul. The gantry, used to haul the trawl and the sled onto the stern. The research study that I am part of, the FOCI study, is a very active group. 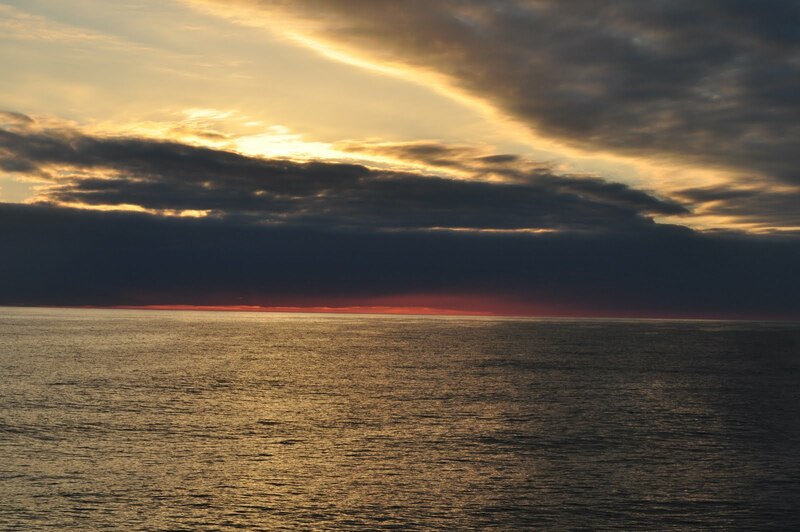 There is currently a group in the Arctic and another cruise just ended before we started. There are 24 crew members on board and 10 scientists. For me the down time has been mainly in front of the computer, doing this blog and other school work. There is a lounge with a TV. movies and TV series box sets available for people to watch. The catalog of movies that they have is extensive. There is also a small exercise room and a small library. Of course there are computers around the ship which have access to the internet. We have not found any “new or different kind of species” There is occasion though when sorting through the beam trawl haul an usual critter gets spotted, the scientist get very excited. For that matter, everyone else does too. It is similar to saying that laughter is contagious, so is the excitement of finding something that is rare. A routine has finally set in here for me and the cruise is almost over. I have never been on a “cruise” before, Carnival, Princess, Disney, nothing like that for me. Now I can proudly say that I went on a cruise with NOAA. The day starts out for me with getting out of my bunk around 8am. That is when breakfast formally ends but the galley always has cereal set out, bread for toast, and almost all the amenities you might find in your own kitchen. So, if I do not get something from the cooks I throw something together myself. I then go into an office like room that is called the data plot room. It has a couple of computers for our use and a ton of equipment. There are a few monitors that keep track of some of the ships vital statistics that are interesting to look at. I work on my blog for usually around 3-4 hours here and by that time I am pretty close to my shift which starts at noon. I eat lunch and go to the science lab to start my shift. 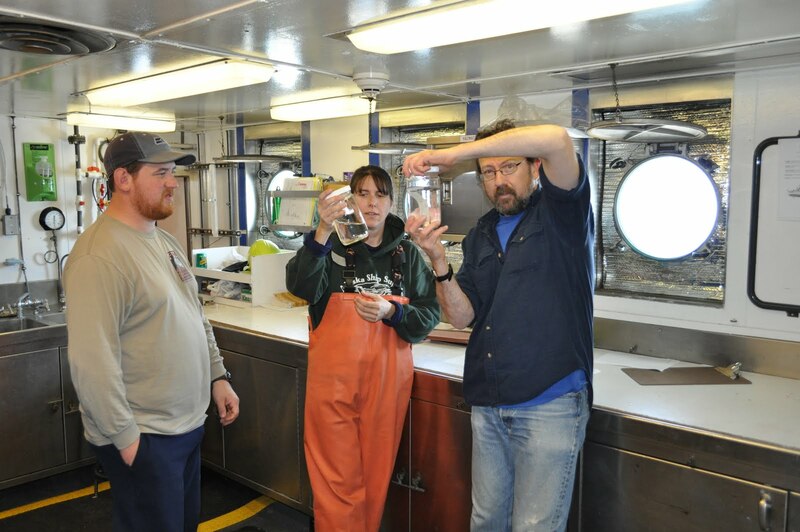 If we are moving to our next sampling station we prepare sample jars and such to get ready. There is sometimes down time between stations to get other things done. If I do step out of the lab for something it is kind of cool because I know when to report because you can feel the ship slowing down for the next sampling station. We then assemble, put on our rain gear, float coats and hard hats and perform the three sampling stations that I mentioned in earlier blogs. The bridge and the deck crew work together communicating over walkie talkies. The bridge positions the ship directly over the sampling station and notifies the deck crew. 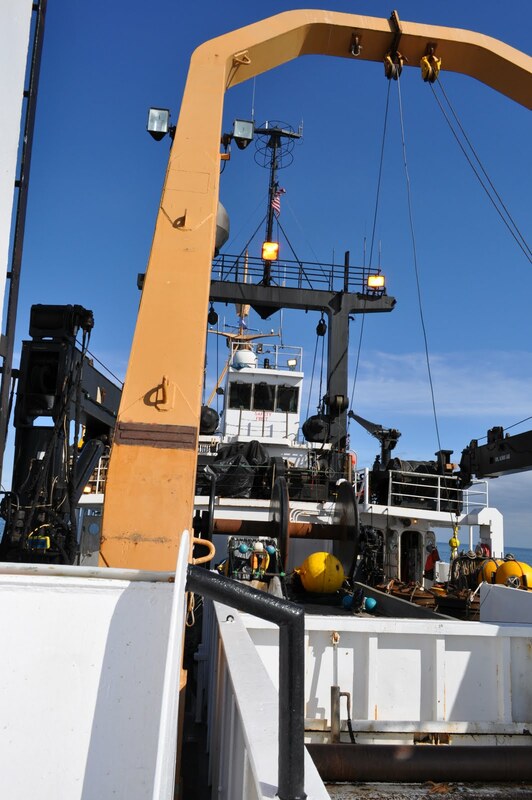 Then the deck crew deploys the gear while the bridge maintains the correct speed and bearing for the specific type of gear that is being used. It is truly a coordinated effort between everyone. Two stations are at the stern of the ship and the other is on the port side. The benthic sled samples get washed down through a sieve and put into a jar and preserved. The jars are the size of peanut butter jars and we have approximately 200, we are at station number 53. So that means we have stopped and sampled 53 times thus far. Remember the sled is designed to capture plankton (he was reported to be stealing the secret formula) which are very small organisms. The benthic grab collects substrate which is also sieved and one part frozen in gallon freezer bags and the other part in jars with preservative. The beam trawl is your classic fishing net that gets dragged behind the boat. This catch is dumped into a small kiddie pool and sorted. This activity draws other people besides the scientists, everyone pitches in and asks a ton of question which are happily answered. Remember this is a juvenile flat fish survey so we are mainly interested in fish that 1-3 inches long. How many different organisms can you spot? This process goes on and off for the duration of the shift, it is like clockwork. Everyone on board knows the general mission and each individual has a task to complete that helps meet the mission. As far as this on looker can tell, the mission is being very successfully accomplished. Stay tuned, even though it is the weekend, I have been accumulating questions and will answer them soon. Let’s jump right in, and not into the Bering Sea, it is too cold. We have not seen any NOAA buoys, or at least I have not. 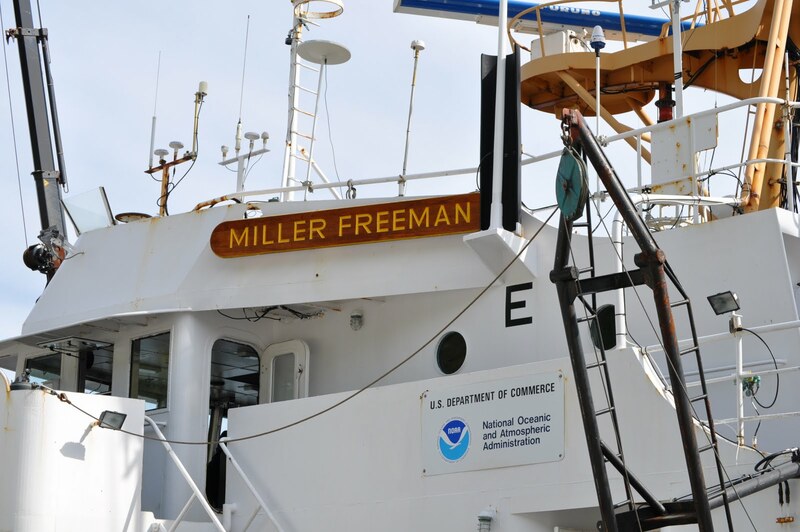 NOAA does maintain numerous buoys but our mission aboard the Miller Freeman is strictly biological, juvenile flat fish to be specific. The types of little fish that we have caught and persevered for further study (remember the freezer) are; Yellowfin Sole, Pacific Halibut, Northern Rock Sole, Flathead Sole, Alaska Plaice, Arrowtooth Flounder, Kamchatka Flounder Greenland Turbot, and larvae of Long Head Dab. These fish that are being saved are relatively small, about 1-3 inches long, they are juveniles. The scientists are trying to determine the mechanism that controls the development of these juveniles into adults. I was also happy to learn that the scientists that are doing the sampling are also the same scientists that are going to be doing the work back in the lab. The identification of these youngsters seems to be effortless by the group of scientists I am working with, they really know their stuff. I have not seen too many ships here while we are out to sea. Last night I did see a light in the distance and assumed it was another ship but did not confirm it with the bridge. We do not fish to catch food for us on board. In fact there are so many regulations regarding fishing that we just focus on the mission and let the cooks in the galley do what they do, and let me tell you it is good. 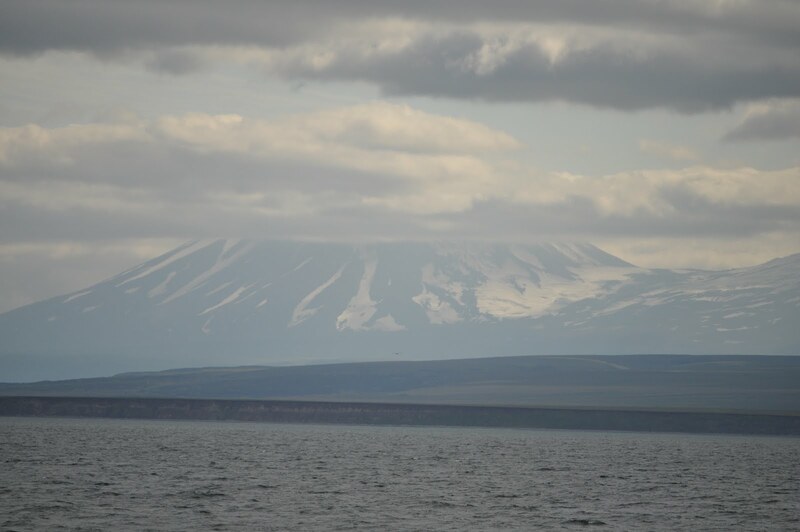 We often do get a glimpse of land, the pictures of the volcanoes on previous blogs are taken from our ship. This video shows me measuring flat fish on the magnetic measuring board that I mentioned in an earlier blog. After imputing the species and other pertinent data, on a touch screen monitor, the fish is laid on the board and a device is touched to the board where the tail is. The length of the fish is recorded electronically. The fish that you see in the video are adults of the juveniles related to this FOCI Research Project and we still gather quantitative data on them. 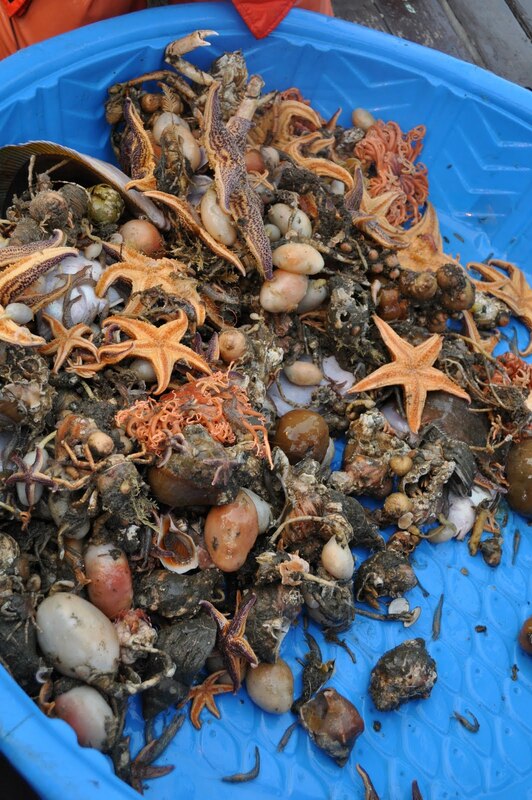 After we catalog them they are returned to the ocean where they have a very good chance of surviving. Keep those questions coming. It is hard to smile wearing a mask! Data such as conductivity, temperature, depth, and chlorophyll abundance will be collected and sea bird sittings will also be documented. Memorial surrounded by Bonin petrel underground nests. 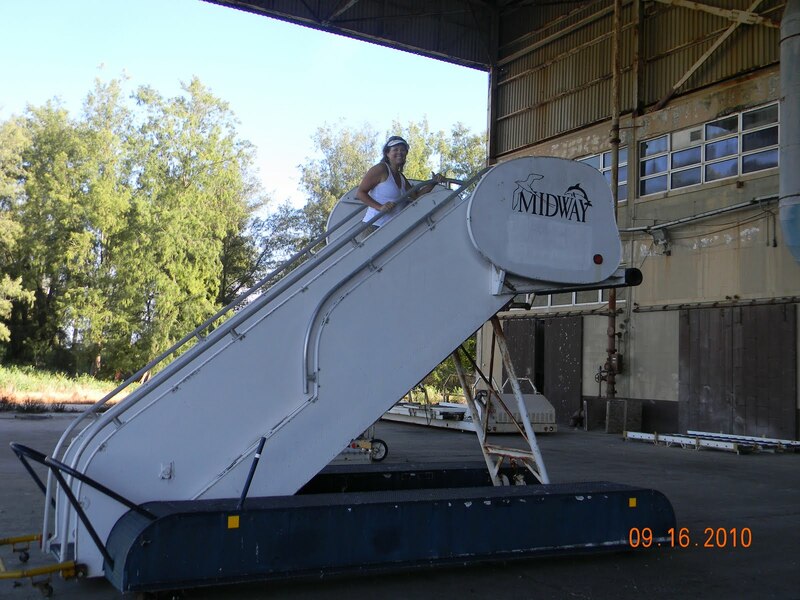 Midway is the second to the last island in the line of islands/atolls extending northwest of Hawaii. 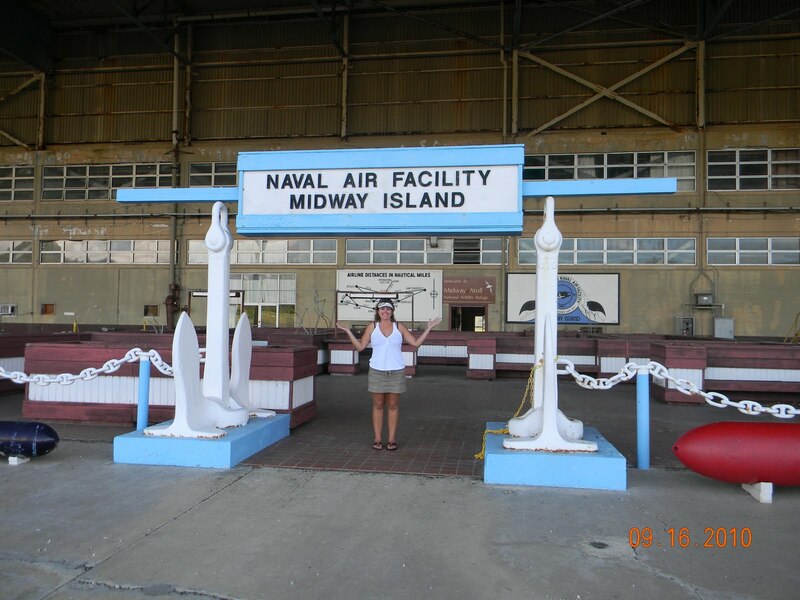 Midway has a lot of history dating back to 1859 when it was first discovered by Captain N. C. Brooks. The island, called Sand Island, at that time was nothing but sand and an occasional tuft of grass with birds everywhere. In 1870 after the Civil War it was felt necessary to have access to Midway for political reasons and a company was hired to cut a path through the coral for steam engine ships to come and refuel. It became too costly and never was finished. On 1903 the Pacific Commercial Cable Company set to work to provide communication between Guam, Waikiki, Midway and San Francisco. At this time President Theodore Roosevelt put Midway under the protection of the Navy because of Japanese poachers. 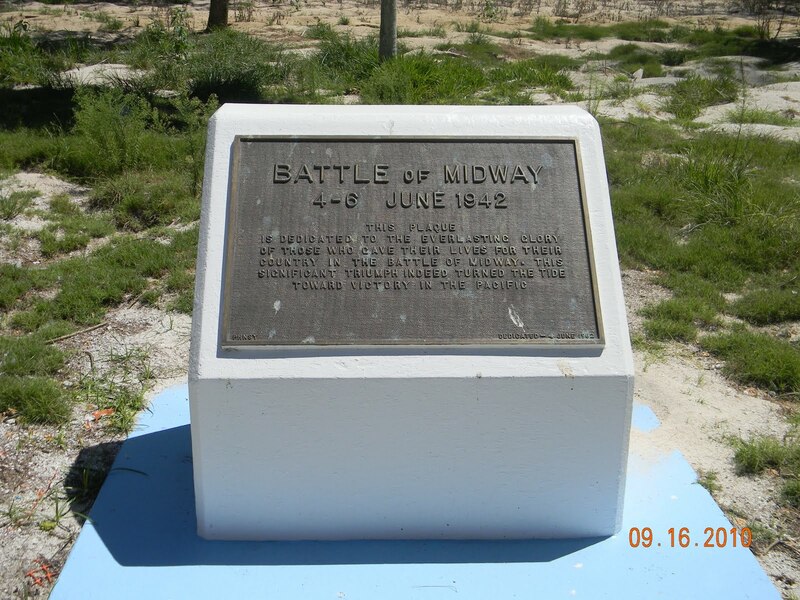 The workers for the cable company became the first planned settlement on Midway. In 1935 Pan American Airlines built a runway and refueling station for their Flying Clipper seaplane operation. They also helped the little community prosper as they transferred goods between Manila and Wake and Guam. 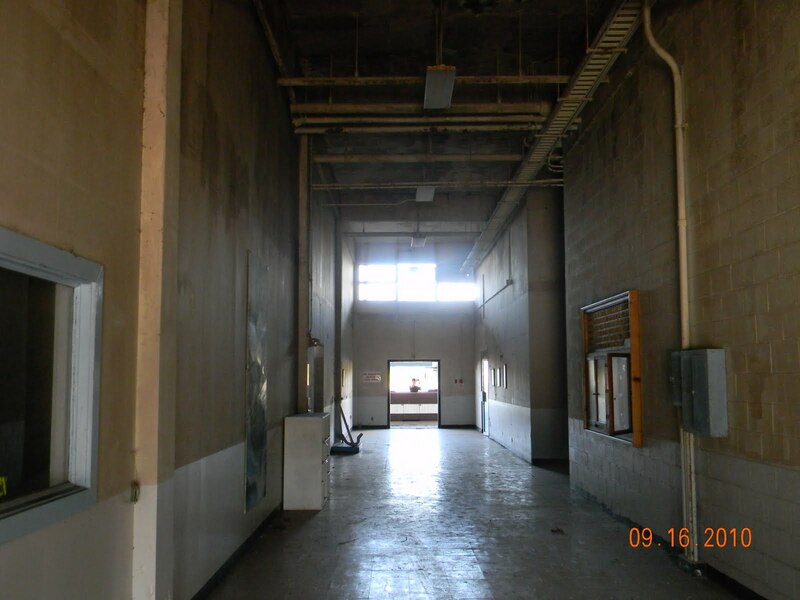 An inside corridor to the Naval facility. The pictures were still on the wall. Midway was made famous in 1942 during World War II. The island had been named Midway as it is “midway” between the continental United States and Japan. The United States had naval control over the island for approximately thirty years, but it wasn’t until 1938 that the Navy made it into a full naval base. They hauled in over a hundred tons of soil in order to plant gardens and trees, to make it appear more like home, and also to build roads and piers. The navy base at one time housed ten thousand people, and was a very important strategic base. Hawaii was at risk from an invasion from Japan and Midway was added defensive support. The Japanese recognized Midway as a threat and attacked it on June 4-6, 1942. It was a fierce battle with many fatalities. It was reported that the Japanese lost 2,500 soldiers while the United States lost 320. The victory of the Battle at Midway was a major turning point in WWII. The airstrip has not been used since the ’60’s. After the war ended there was less need for the Midway Naval Base. Most of the people left Midway 1950, leaving behind buildings with the holdings intact. In 1988 the military released the island to the United States Fish and Wildlife Service and Midway became a national park and refuge to protect the shorebirds, seabirds, and threatened and endangered species. The upkeep of the naval base has fallen on the shoulders of the U.S. Fish and Wildlife Service. They have torn down some of the buildings constructed before 1950 that are not repairable. 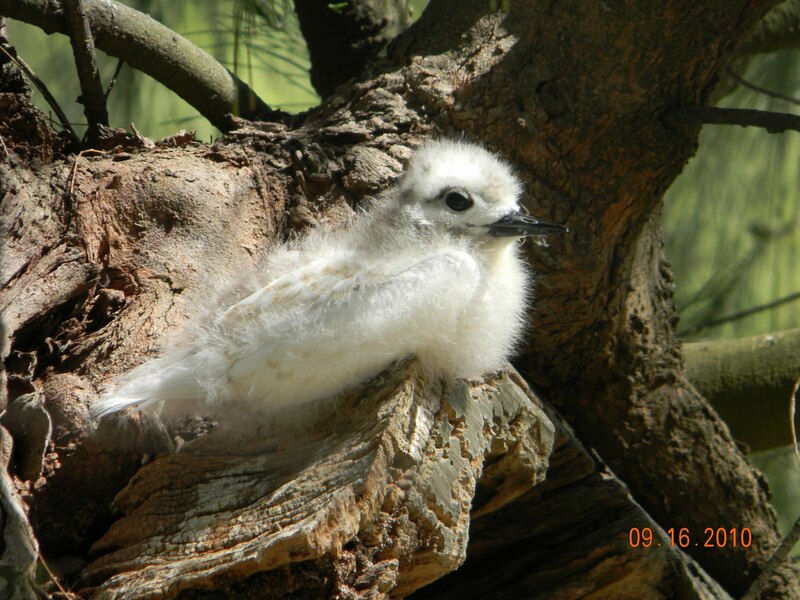 The fish and wildlife service is making room for more birds by clearing out some of the ironwood trees which have overgrown the island. 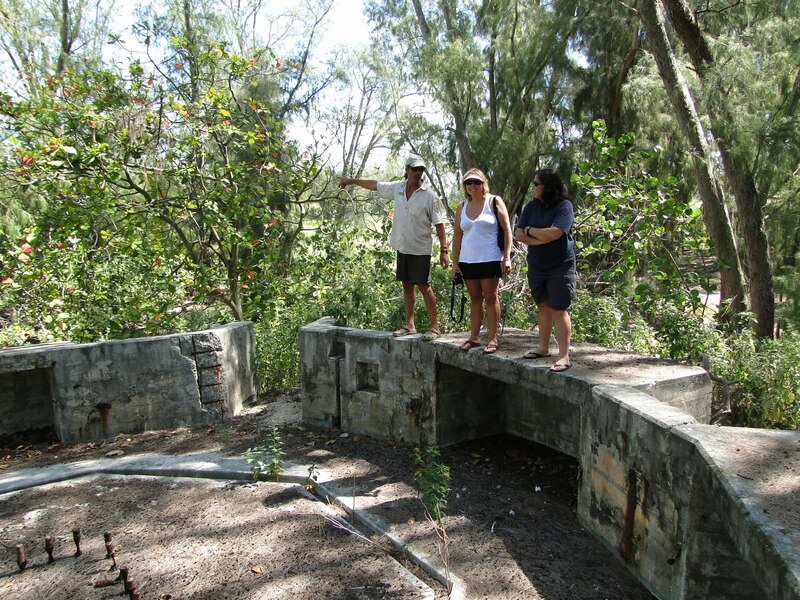 There are sixty-three places on Midway that are considered eligible for National Historic Landmarks. 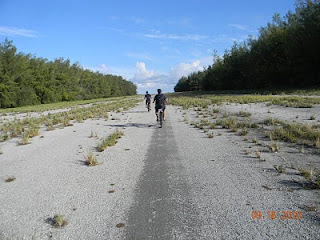 Dr. Tran and Stephanie riding ahead of me on the old runway. The trees were filled with common myna birds. In addition to the historical significance of Midway, many animals find a sanctuary within the atoll. Nineteen species of birds, approximately two million birds, nest on Midway. In the water there are about two-hundred fifty spinner dolphins, the threatened green sea turtles, about sixty endangered Hawaiian monk seals, more than two-hundred sixty-five species of fishes, and forty plus species of stony corals that make Midway atoll home. Isles of Refuge, Wildlife and History of the Northwestern Hawaiian Islands, by Mark J. Rauzon, copyright 2001. White terns lay an egg without a nest. Today I am lucky enough to go to Midway! I have read up on it and expect not only to see a beautiful destination with an abundance of wildlife, I will be seeing first hand a historical site few people have had the pleasure to explore. My swimming suit is under my clothes so I’m also ready to try out the beaches! Mills and Chris are escorting me, Dr. Tran and the XO, Stephanie, on the small boat to the island. Mills has to weave in and out because of all the coral. Mills is one of the few who have had the opportunity to see Midway and he is giving us last minute advice. We are met at a small dock by John, a warden for the U.S. Wildlife Service, he is going to be our tour guide. As I watch the small boat head back to the Sette, I can’t help thinking that it feels like the beginning of one of those “stranded” movies. This is not what I pictured. There is trash everywhere. To the right I see the rocky shore littered with garbage. 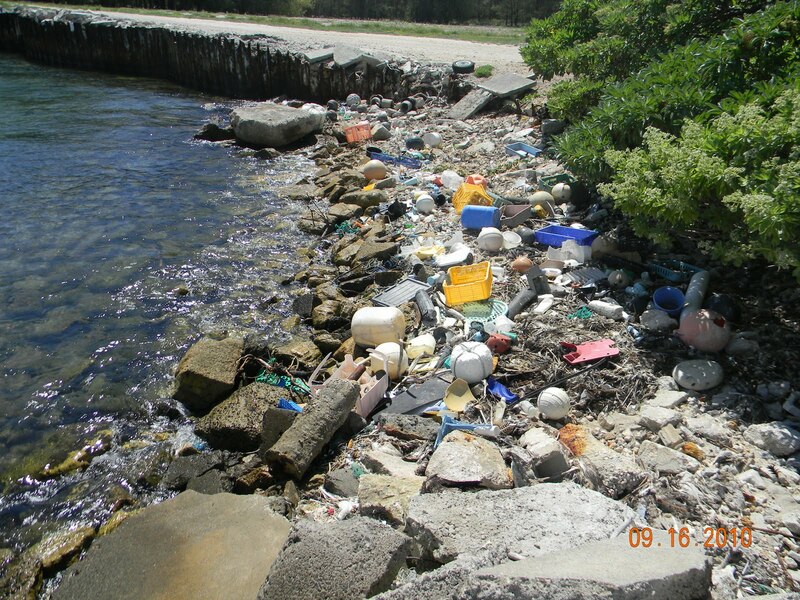 Plastics everywhere, all shapes and sizes right next to the sparkling clean water. Ugh! Piles of twisted metal are heaped in piles twenty feet high. Then there are the piles of uprooted trees and old lumber. I guess it is organized waiting to be hauled out, but I didn’t see any of that in the literature I read. 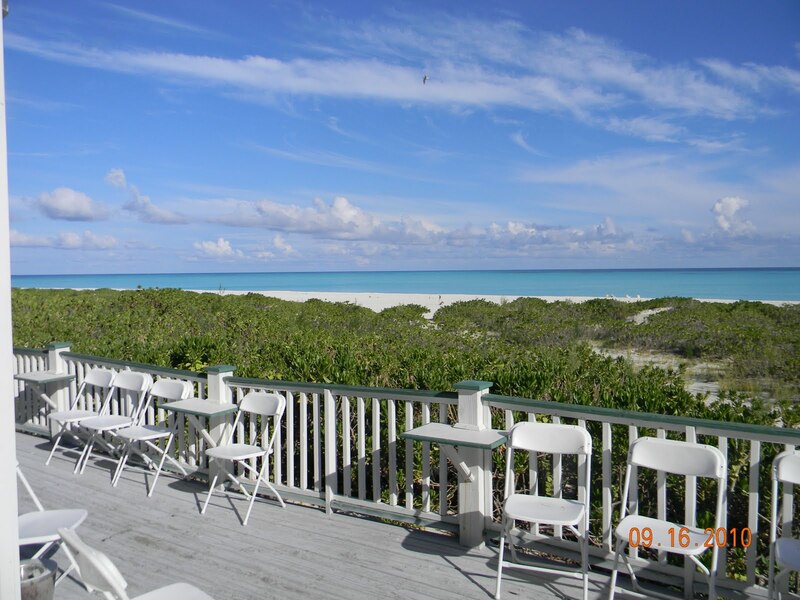 I am standing on the deck at”Captain Brooks”. It was named after the man who claimed the island for the United States. This was my first view of North Beach! Unfortunately the garbage people throw out to sea is being collected on the atolls and banks of the Northwestern Hawaiian Islands. Crates, buckets, balls, anything and everything imaginable that is made from plastic is showing up on these unpopulated, remote islands. It is the currents that carry the debris to the islands and the corals and beaches trap and collect the material. Very sad. People are so uncaring and oblivious to what they do daily to the environment. John is very friendly and laid back, ok, I don’t feel like the star in one of those silly sci-fi movies I love to watch, any longer. We three hop on a Kawasaki “mule” and head away from the dock. Most of the buildings we pass are left-overs from the war, rusty, broken windows and even bullet holes. John drives up to the Visitor Center/Office. He gives us a general briefing on how things work there and mentions some of the sites we should see, and off we go again. Now our mode of transportation is a golf cart. He shows us where we can go on our own and tells us where not to go – the air strip. Now I’m thinking “bad movie plot” again. John described how the cannons were bolted to the center. At that time there were no trees and the guns were aimed at the Japanese ships in the ocean. He gives us bikes and we start our own tour. We need to stay on paths or roads because the land is covered with holes for Bonin petrels. They are nocturnal birds and burrow underground to nest and lay their eggs. At one time Midway had a rat problem and they ate the chicks and eggs, so now that they have been eliminated, this is a true bird paradise. It is fun to ride around and look leisurely at the island. Doc had been there before so he was in the lead. As we look around at the wonderful wildlife the ground is also littered with small plastic objects. I see a toothbrush, a lighter, and bottle tops all over! Other plastic objects with strange shapes seem to catch my eye. What is going on? Doc explains to me that the albatross that go to feed in the ocean will see something resembling a fish, swoop down to get it and bring it back to shore for its offspring. Once regurgitated, the fledgling may also eat it and then die with a stomach full of plastic. Great! Where is this plastic coming from? Why hasn’t it stopped? I am told later that tons of trash washes up every year. Ugh! Back to our tour. 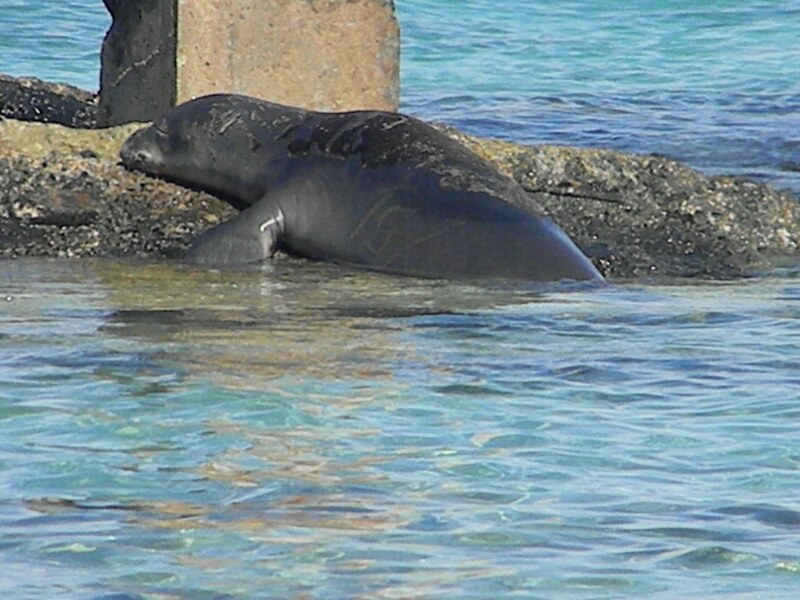 A monk seal basking in the sun at “Rusty Bucket”. Little white terns are above us following us on our paths. There are so many trees! From once an island with only a few tufts of grass, and now seventy years later, Midway has a forest. It smells musty, old and slightly sweet, if you didn’t look too close, you would think you had fallen back in time. We head for the beach! Nothing eerie about the beach! Absolutely spectacular! Soft white sand bordered by lush, thick leaved tropical plants. The water was so clear, not a rock, not a piece of garbage, if it hadn’t been for the four beach chairs you could have imagined discovering an untouched pristine utopia. I could not help but stand and stare at the soft pale turquoise water. It felt as good as it looked. We all loved our limited time playing in the water as though we were kids in the biggest swimming pool imaginable. 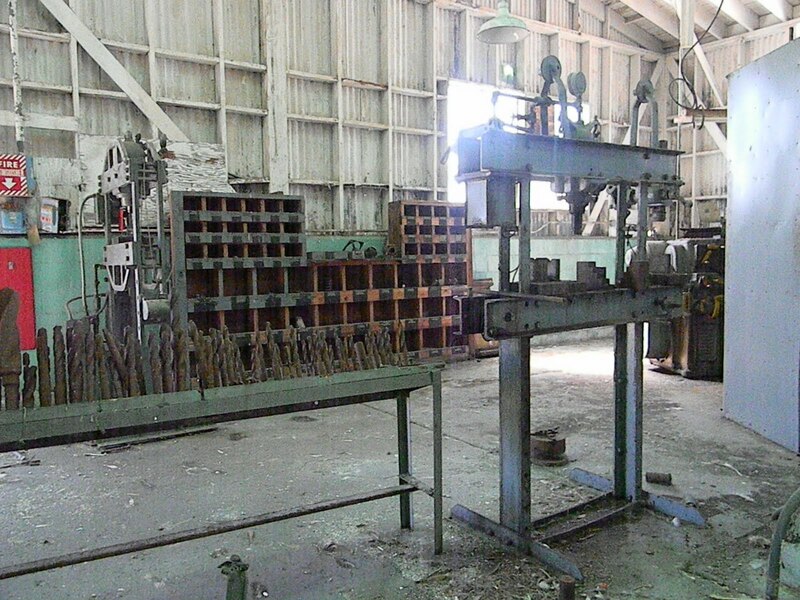 One of the machine shops. All the tools were left behind. Unfortunately we had to get back to the Visitor Center so we trodded up the incline back to the bikes. With John on the golf cart, we resumed out guided tour. One of the first places we go is the “rusty bucket”. It is a site along the shore where ships and other vehicles have been left. We see a basking Monk seal. Monk seals are nearly extinct, they only live on the shores of the Hawaiian Archipelago. John shows us where the large cannons were bolted to shoot into the bay, a graveyard of the early inhabitants, and in town many old buildings. Some of the shops have all the tools still in them. It is as if it is being left just so, waiting for the people to return and continue their projects. One of the buildings that is still in pretty good shape is the theater. It has all the old felt covered seats, the wood floors and the dull yellow colored walls you see in old movies. The stage is still intact and you can almost picture the place full of people watching Bob Hope perform. He stayed at Midway entertaining the troops off and on throughout the war. John gives us a great tour, but has other jobs to do, so we are alone once again to fend for ourselves. Where do we go…the beach! It is called North Beach. A Coast Guard ship has docked on the other side of the beach around a corner. I just lay and float trying to appreciate every second I have been given! A green sea turtle swims up to check out the strange humans and off he goes. They are threatened and this is a refuge for him. Mills has lent me his snorkel and fins so off to explore I go. 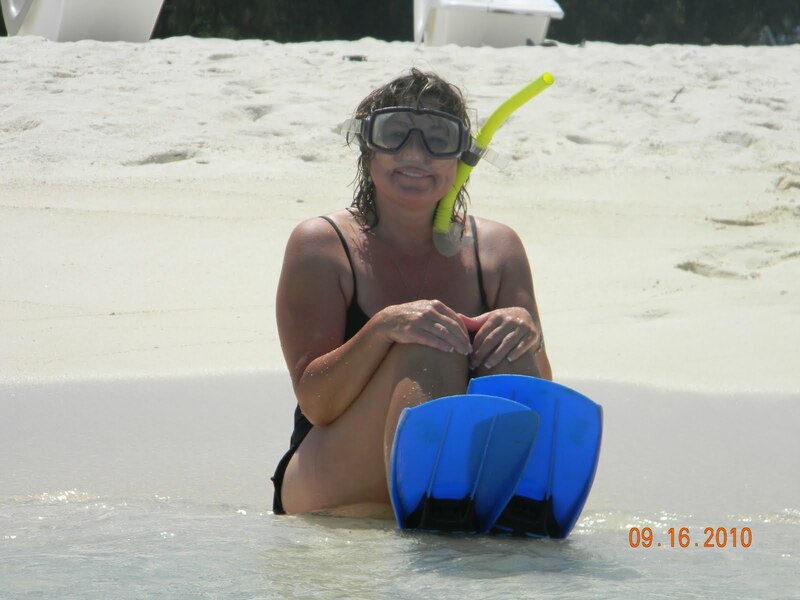 We are within the atoll and can see waves crash on the corals miles away. No risk of anything catching you off guard with such great visibility. 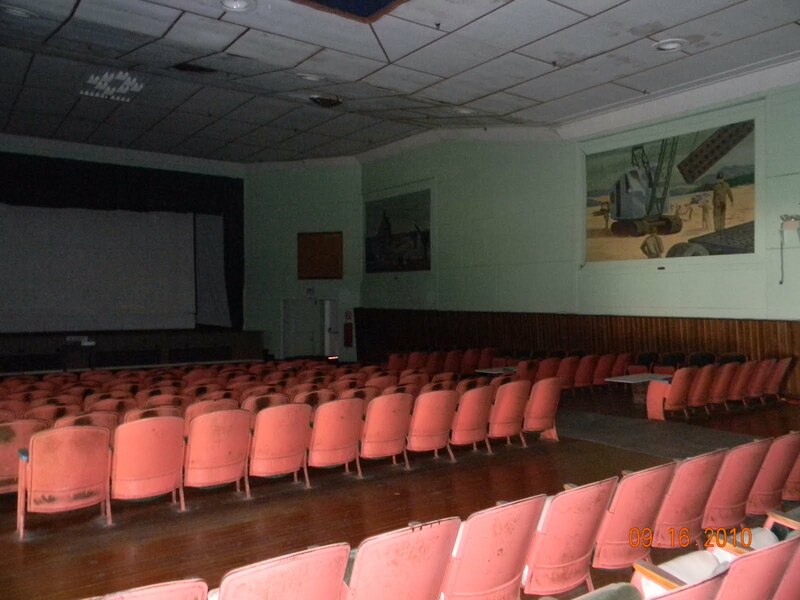 The movie theatre still decorated with the original pictures. It was truly spectacular! 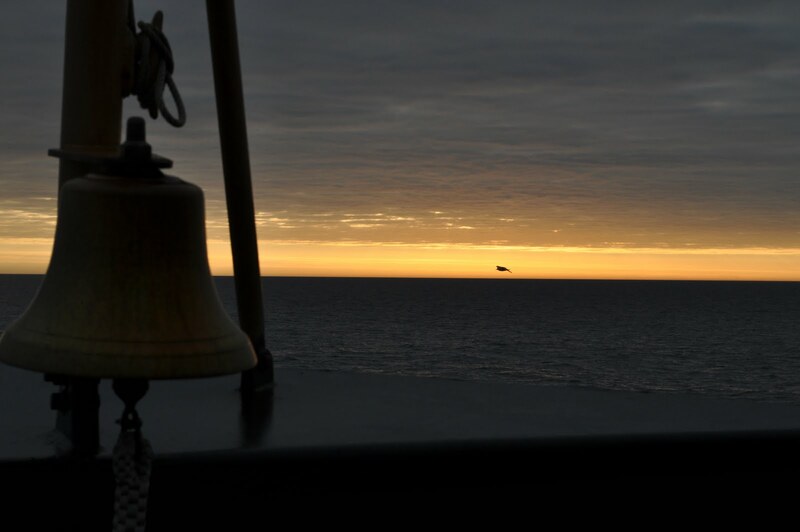 The Sette is coming back to the area and the small boat will be coming to get us soon. We head back to the dock. On the radio Stephanie hears we have one more hour to be tourists. John suggests snorkeling by the cargo pier and that sounds wonderful to me! Stephanie and I jump off the pier to the water fifteen feet below. The water is thirty feet deep and looks and feels wonderful! There are fish of all shapes and sizes! I feel as though I am swimming in a giant aquarium. I even saw a sleeping green sea turtle on a broken pier support. Incredible! We were weaving in and out of the pier supports looking all the way down thirty feet and seeing everything crystal clear. All good things come to an end and our little vacation at Midway was over. Doc, Stephanie and I had a “fabulous” time! The small boat was back. It was time to go back home to the Sette. Midway is definitely a place of contrasting sites and interests. I leave with mixed emotions, which are the seeds for memories, of a place I will never forget. The science is going forward with rigor here on the Miller Freeman. If you get a chance you should go back to this link http://shiptracker.noaa.gov/default.aspx so that you can see the area that we have covered. I also made an error in reporting that the seas that made me sick were 9 foot seas when they were actually 12 foot seas. The forecast calls for flat seas, 2 feet, through Friday. I have received a few questions through the blog and I will try to address them here. The first one is about the marine mammals http://en.wikipedia.org/wiki/Marine_mammal that we have encountered while out at sea. On board with us is a bird observer and his secondary function is to identify and count any marine mammals. He reported to me the following list; Killer Whale, Humpback Whale, Harbor Porpoise, Dall’s Porpoise, Fin Whale, Minke Whale, Northern Fur Seal and Steller Sea Lion. I was lucky enough to see the Humpbacks and even saw one breech, jump out of the water and land on its side. An interesting fact about the fur seal is that they will stay at sea for up to 8 months and only come to land to breed. Another question that I received is regarding a picture that I have posted on my blog. It was a picture of a volcanic mountain, Mount Shishaldin. http://en.wikipedia.org/wiki/Mount_Shishaldin A description of this volcano is sufficient in understanding the characteristics of it but its majesty is truly appreciated viewing it in person. To find Central New York’s radar, which shows precipitation, click on the link and mouse over Central New York and click. The Montague radar should come up. Montague New York, the town that received 8 feet of snow in one storm a few years ago. It is no surprise though seeing that it is in the Tug Hill Plateau and orographic lifting http://ww2010.atmos.uiuc.edu/(Gh)/guides/mtr/cld/dvlp/org.rxml happens to air masses coming off Lake Ontario here. We call it lake effect snow. When on this site in the upper left corner is a grid with adjacent radars. Most weather moves across our country with the southwest prevailing winds. So if you click on the grid to the left, Buffalo radar for example you can see what is coming your way. 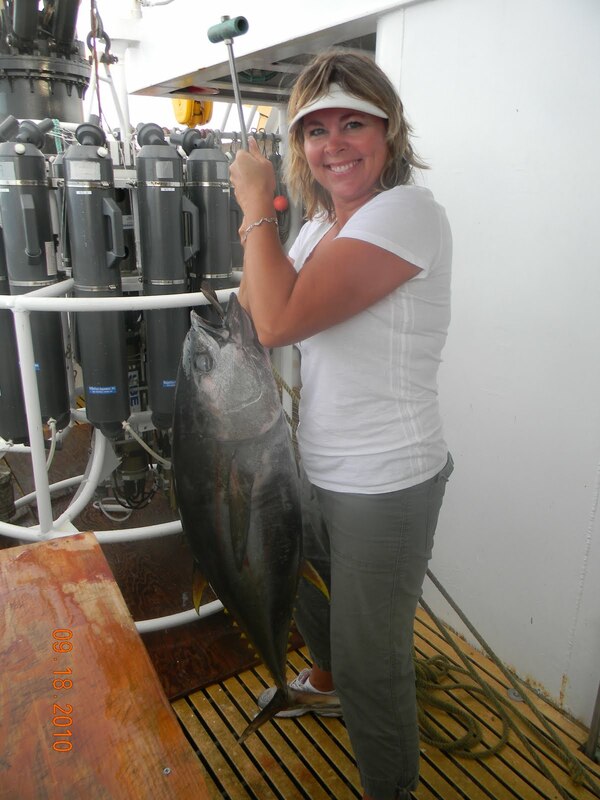 I am holding a tuna that Mills caught. 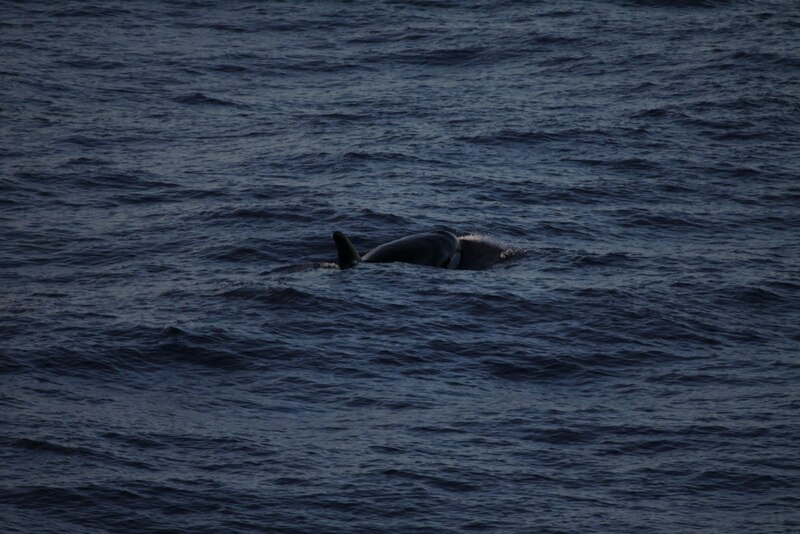 The Oscar Elton Sette is on a mission called HICEAS, which stands for Hawaiian Islands Cetacean and Ecosystem Assessment Survey. This cruise will try to locate all marine mammals in the Exclusive Economic Zone, called the “EEZ”,aound Hawaii. The expedition will cover the waters out to 200 nautical miles of the Hawaiian Islands. Also part of the mission is to collect data such as conductivity for measuring salinity, temperature, depth, chlorophyll abundance. Aquatic bird sightings will also be documented. Killer Whales coming up for air. Orca is another name for Killer Whale. They are some of the best known cetaceans. Killer whales are the largest members of dolphin family. Killer Whales are easily recognized by their huge dorsal fin that is located in the middle of their backs. The male’s dorsal fin is usually between three and six feet high. Orcas have unique flippers that are large broad and rounded. Their bodies have a black and white color pattern. The male Killer Whale can reach thirty feet long and weigh at least twelve thousand pounds. The females are smaller in size reaching only twenty-six feet long and weigh eight thousand four hundred pounds. The females may outlive the males by twenty to thirty years, living between eighty to ninety years. 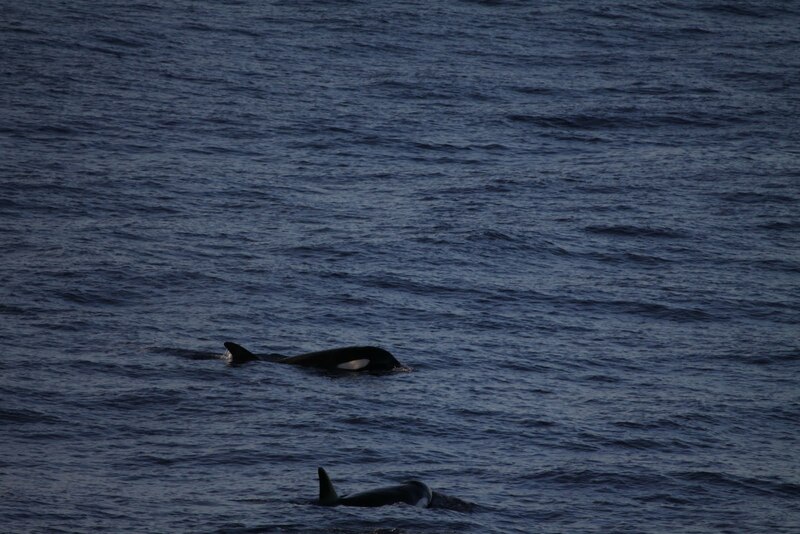 Killer Whales are not limited to any particular region. Depending on the prey they prefer, Killer Whales can be found in cold or warm climates. Orcas have a varied diet which may consist of fish, squid, large baleen whales, sperm whales, sea turtles, seals, sharks, rays, deer and moose. Pods tend to specialize in a particular food and follow it. Killer Whales tend to use cooperative hunting groups for large prey. Orcas form matrilineal groups sometimes containing four generations. All females help with calf rearing. 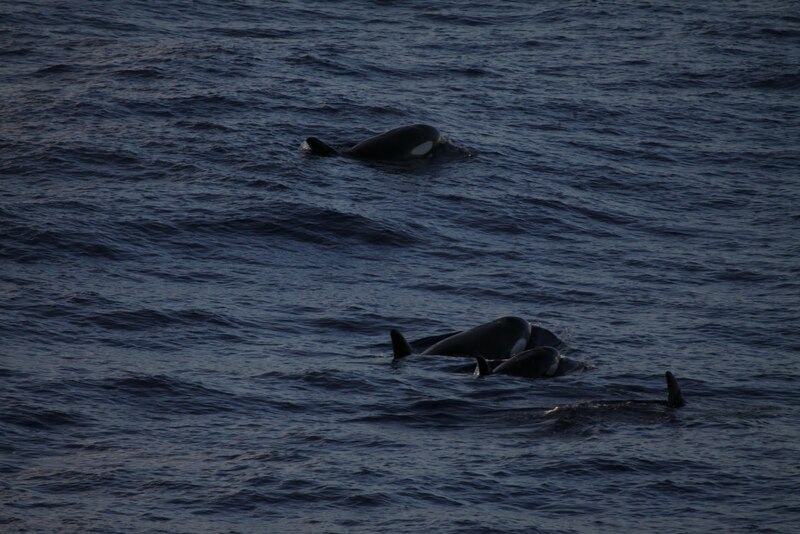 The females are more social and may be associated with more than one pod, but males are usually by themselves. One group near British Columbia contained approximately sixty whales. Killer Whales are not endangered, but numbers are declining in Washington and British Columbia. The reasons for the decrease in whale numbers is not known, but possible factors may include chemical or noise pollution or a decrease in the food supply. In the middle is a mother with her calf. I was just leaving the bridge after the XO (executive officer) asked me if I would like to join her and Doctor Tran to Midway tomorrow. I knew we were stopping to pick up Jason, a Monk Seal Biologist who needed a boat ride from Midway to Kure Island, but I heard no one was going ashore. So when she asked, I was totally thrilled and extremely excited to get my feet wet and of course said yes! Three adults and a calf. In the middle of my self -doubt, Adam comes running up the ladder screaming, “KILLER WHALE! !” Drat why didn’t I say anything! 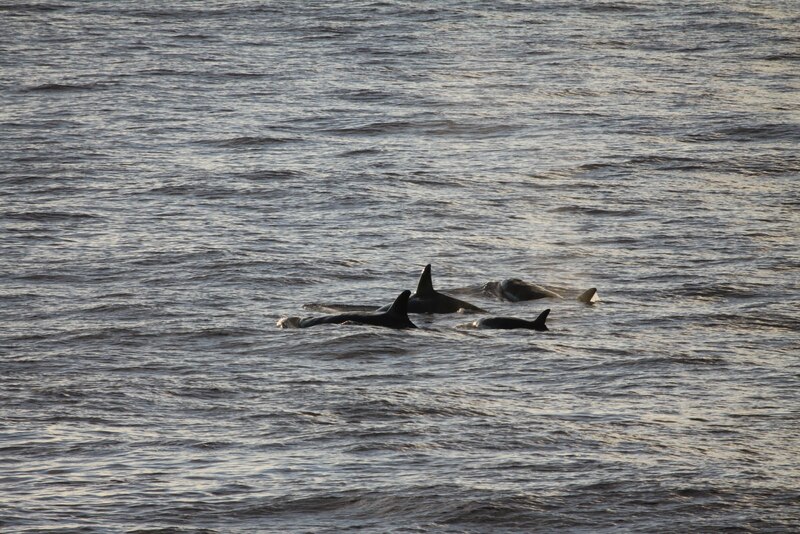 There wasn’t only one, but five killer whales! One was a mother with her small calf! Wow what amazing animals! I couldn’t stop staring, and I wasn’t the only one. There was a “full house” on deck again with everyone oooing and ahing. Orcas aren’t typically seen in this area, but then again this is a survey ship, and this area hasn’t been surveyed in a very long time. When the small boat was launched to try and tag one of the adult whales with a tracking device, they dove never to be seen again. These animals are just too smart. What an extraordinary experience! Tomorrow I will have another adventure! An adventure few people have taken. I am going to Midway. 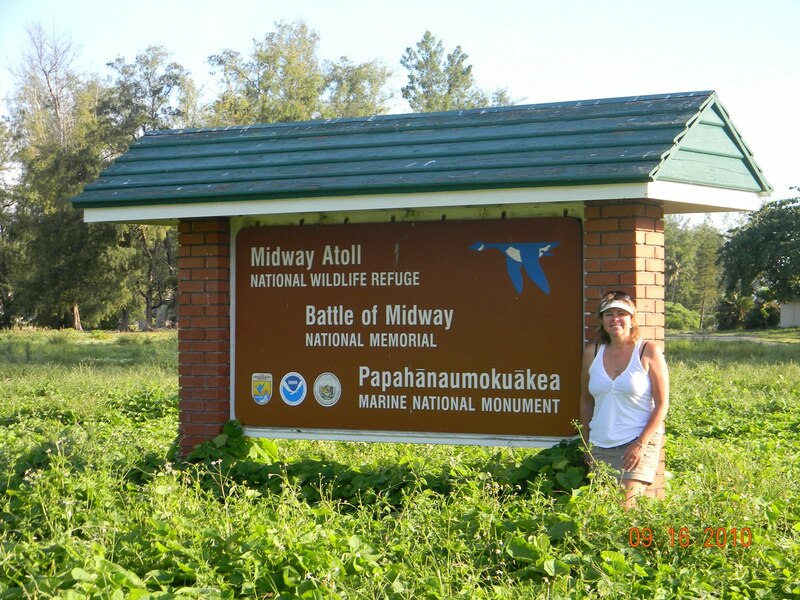 Midway Atoll is now a National Wildlife Refuge and also holds the Battle of Midway National Memorial. I’m off to see a glimpse of our nation’s past and a birding and seal paradise!